Forum Index > Off-topic Talk > Spadroons and their methods of use? Posted: Wed 17 Jan, 2007 10:15 am Post subject: Spadroons and their methods of use? I know this is veering far away from my usual line interest. I just can't help asking the question. Most of the sources I've read define the spadroon as a "light cut-and-thrust sword" and I've seen enough pictures of examples to get a feel for the sword's form. What I'm curious about is their usage--is there a distinct style of spadroon swordsmanship distinct from those of the smallsword and the broadsword? Who were the writers, if any, who expounded on its use? And what are the unique characteristics of the spadroon techniques as compared to other forms of swordsmanship? Anthony Gordon's Treatise on the Science of Defence, for the Sword, Bayonet, and Pike, in Close Action (1805). Posted: Wed 17 Jan, 2007 5:39 pm Post subject: Re: Spadroons and their methods of use? The 17th century Scottish swordmasters Donald McBane and Sir William Hope referred to the spadroon as a "shearing sword" and called it "the master of all weapons". It was quick enough to hold its own against the smallsword and heavy enough to deal with broadsword. Personal experiment suggests they were right. McBane and Hope are reprinted in "Highland Swordsmanship" By Mark Rector and Paul Wagner, from Chivalry Bookshelf. McBane gives a couple of spadroon guards and techniques, but nothing extensively specific. As I understand it so far, both Hope and McBane's methods can be applied directly to spadroon, as can a lot of 18th century backsword technique. For backsword, a lot of the better information can be found in Paul Wagner's "Highland Broadsword" book, also from Chivalry ( not 100% sure of the title). What makes the spadroon unique, apart from having the best of both worlds in effect, is something I'm still looking at., and I'd berhappy to let you know the results of some more practical study. Personally, I'd like to see spadroon featuring a bit more in WMA. "Nothing could be more useless or more ridiculous than the old Infantry regulation [sword]; it was good neither for cut or thrust and was a perfect encumbrance. In the Foot Artillery, when away from headquarters, we generally wore dirks instead of it." Perhaps this belief was a result of a number of officers who were unschooled in its use, I don't really know as I have no experience fencing with a spadroon. Or maybe the weapon is just not that great. I own a 1796 Infantry Officer's Sword, and while it is quite attractive, I would not want to defend myself with it against a stouter sword blade (e.g. 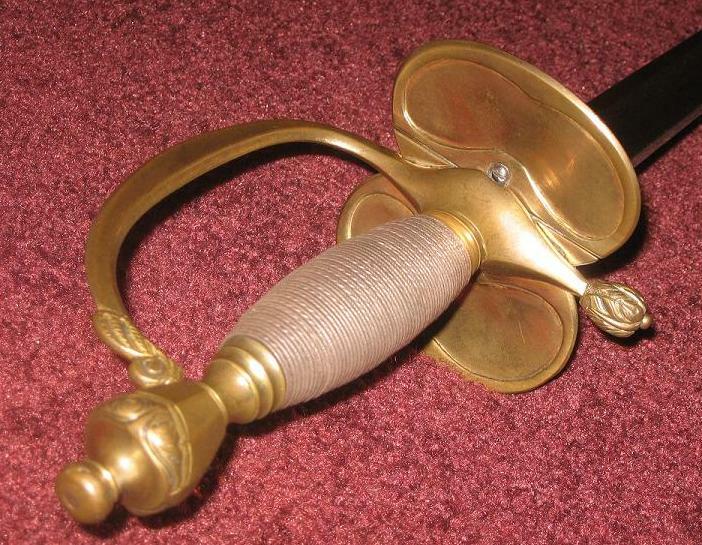 a cavalry sword). The blade is about 31" long, and is 1" wide at the shoulder. It weights approximately 1.5 lbs. (give or take a few oz.). Carlo at Hemac has done some work on the Spadroon, (see the link for one of his articles) if you can contact him he'll send you a guide to fencing with the spadroon. "A bullet you see may go anywhere, but steel's, almost bound to go somewhere." Well, I think this disagreement is just to be expected. Even among experienced swordsmen, personal preferences would have a major role in shaping the opinions about the utility of a sword form, and people who preferred other types of swords would certainly dislike the spadroon. I'm a broadsword man myself, and this sudden curiosity about the spadroon is probably a greater surprise to me than to anybody else. And somehow it seems like the people who diparaged the spadroon were military officers while the ones who preferred it were civilian swordsmen. I can easily imagine why the sword would have been more useful in the street than in the battlefield--in a battle, the sword would have probably lacked reach and the ability to make broad chopping cuts, but in the street its relatively shorter length might have been advantageous in the confined spaces. Would such a generalization be valid? When was the last attested occurence of the spadroon, BTW? Was it still conspicuously present in the 19th and early 20th centuries? Or was it actually the most direct ancestors of the narrow thrusting swords adopted by many 20th-century cavalry forces? Sorry for the flood of questions. It just seems like such a funny bladeform that I can't help my curiosity. Could anybody offer opinions on those sources and their relevance to spadroon fencing? Other nations certainly used spadroons, but I am less familiar with the models or the length of their use. I'll see what I can find when I get home. As far as the spadroon evolving into the thrusting swords used by the cavalry, I would say that the connection is unlikely. At least in Britain, the final verdict for cavalry swords (the 1908 Pattern Cavalry Sword) was that the thrust was superior to the cut, and the focus was therefore on creating the ulimate thrusing sword, not on creating another cut and thrust weapon (like the spadroon). Interesting. Are you aware of the longevity of the spadroon as a civilian sword design in Britain? Or was it strictly a military sword there? (Which seems unlikely considering the tone of Sir William Hope's treatise). I am not aware of it being used as a civilian weapon. It is certainly not out of the realm of possibility, however. I will have to take a look through Hope and others to see what they say. I just asked a friend who collects British Infantry and Naval spadroons about the military or civilian use of the spadroon, and he said that it is currently considered to have been exclusively a military weapon. There are some smallsword hilts with lighter spadroon blades, but they are generally considered to be military pieces as well, probably for dress. He also suggested that if a civilian wanted to carry a cutting blade that it would have liekly been a cuttoe (hunting sword). The smallsword, which would have been the civilian weapon of choice in the 18th century, was falling out of fashion during the last decade of the 1700s. If spadroons were carried by civilians, I doubt they would have remained fashionable beyond the years of the smallsword. Spadroons have numerous hilt forms, and are really fascinating to study. If you are interested in viewing more late 18th century spadroons and civilian weapons such as smallswords, I recommend Swords and Blades of the American Revolution by Neumann, The Small-Sword in England by Aylward, British Basket Hilted Swords by Mazansky, and Swords of the British Army by Robson. Two works geared more towards collecting than academic inquiry include British Military Swords and World Swords by Withers. These last two books have a number of color photos which are most welcome as the former four books rely on black and white photography. If one has any interest in collecting spadroons, this is a fairly accesable sword form to collect as there are relatively good quanities available on the market and prices are generally between $500-$1000 USD (sometime more and sometimes less). "All the references to spadroons, shearing swords etc suggest they are military adaptions of civilian weapons, certainly fencing instructors who wrote manuals such as Gordon and Taylor refer to them as such." "Military adaptation of civilian weapon?" Well, that's a very concise summation. Very to the point as well. But, if I may impose a little upon the knowledge of this collector friend, may I ask whether he implies that the spadroon and its related techniques were designed to allow gentlemen who were already familiar with civilian smallsword fencing to have an effective way of fighting in a military encounter? If so, it sums up things quite nicely. And actually I can see the spadroon being an extremely effective sword for the duels between officers that often happened during the lulls in the fighting that often took place in prolonged battles. It would also explain why some officers were contemptuous of it--because they had not had prior training in civilian smallsword use. But, if I may impose a little upon the knowledge of this collector friend, may I ask whether he implies that the spadroon and its related techniques were designed to allow gentlemen who were already familiar with civilian smallsword fencing to have an effective way of fighting in a military encounter? Yes, that is what I thought he was saying. 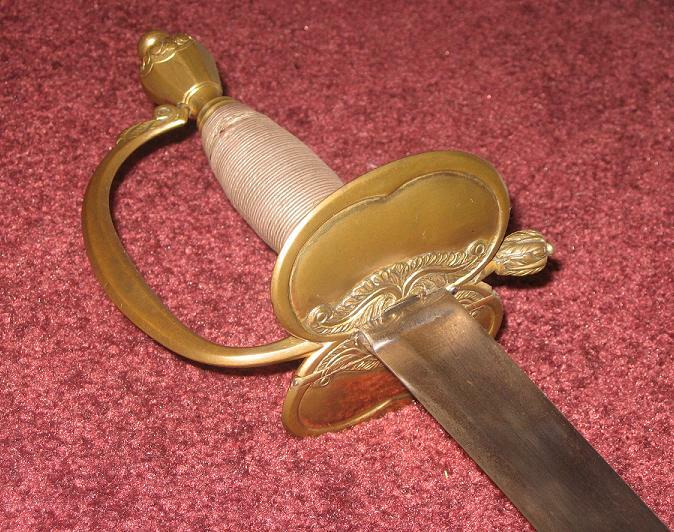 I own a 1796 Infantry Officer's Sword, and while it is quite attractive, I would not want to defend myself with it against a stouter sword blade (e.g. a cavalry sword). The blade is about 31" long, and is 1" wide at the shoulder. It weights approximately 1.5 lbs. (give or take a few oz.). I have no experience with either a spadroon or broadsword, but the spadroon does look somewhat delicate for battlefield use. A broadsword is much more menacing and stout so I could see it being prefered. I still think I would prefer a spadroon over a dirk though. Wouldn't a spadroon, even if you aren't keen on it, be more effective than wearing a dirk instead? That quote about wearing a dirk instead has me confused as too the reasoning behind the preference of a dirk. Yes a spadroon may not have superior reach and cutting ability to a broadsword, but it has superior reach and cutting over a dirk, does it not? Also, I read this thread several times and didn't seem to find it (perhaps I missed it several times? ), I was wondering when the spadroon first came into use? While wanting to shush you , I have to agree. There are quite a variety and having bought one, I find I want at least one (or so) more. This is definitely a pattern not well represented in the reproduction market. There are some but not ones done well that I'd like to see. Oops! Sorry Glen...I didn't intend to create more competition for you! I agree with your last point. I have not seen any high quality spadroon replicas. I would think that a custon smith would be the way to go at this point in time. Perhaps Old Dominion Forge (if he is taking on any new work). "The Pattern 1786 sword was clearly intended as a fighting sword if necessary and the blade was not ill-adapted for the purpose, although rather light, even if the type of usage was perceived as more in the way of an elegant duel between officers rather than with heavy cavalry. The guard, however, whether of bead or other pattern, was flimsy and gave minimal protection." Here are two articles by my above referenced friend, David Crichtley: The British Infantry Officer's Sword 1776-1815 and The 5-Ball Hilt in Europe and America. It was my very first sword, purchased when I was 14...so, no. I'd also prefer a broadsword, since I'm far more familiar with Silver than with any smallsword fencing techniques. This is why I said I'm ranging well outside my usual field of interest. But Hope's treatise may change that--it's entertaining to read and I'm definitely tempted to try his techniques out a little. I believe officers who have had prior civilian background in smallsword fencing would have thought differently about the matter, though. And the spadroon, while not being a weapon I'd trust in the heat of the battlefield, would have been reasonably effective for formal challenges between officers, handling drunken brawls in the camp, or, say, fighting off a surreptitious attempt by a jealous comrade. If I'm allowed to do some theoretical speculation. And that also answers the question about the dirk. If the officer in question hasn't had smallsword training in civilian life, he might have had difficulties grasping the intricacies of spadroon use. Dirks--being essentially simple daggers--would have been a more instintive choice for them. Re-reading that quote about the dirks, it was written by an artillery officer, so the hand to hand combat they did see was perhaps in a more confined space (and was perhaps less of a hindrance to carry than a sword would be if hand to hand combat was not a regular occurrance). Neumann states that the spadroon emerged during the second half of the 18th century (Aylward says the same). To try to be a bit more specific, the earliest date I have seen assigned to a spadroon is the 1760s (for a British example, that is). Mmm. Funny. The official name of "spadroon" itself appears quite late, but if Hope and McBane are already designing techniques suitable for the form in the late 17th and early 18th centuries...what kind of conclusion should we draw from it? And, BTW, the linked articles are interesting, especially the first. Also the utility benefit of a dirk versus a sword was probably more to liking of an artillery officer of the time. Are Hope's and McBane's techniques specifically for the spadroon, or are there methods applied to spadroons (i.e. techniques for smallsword or backsword adapted to the spadroon)? I only ask because I think that the spadroon, while perhaps technically a backsword, is at least in size and weight, a different animal. If the spadroon is considered to be a more slender bladed backsword, then I would still consider Neumann's and Aylward's dates for the spadroon to still hold true. I found a nice photo of a Bavarian (I think) spadroon with an ebony grip. I'll try to post the photo this evening. Lafayette, if you pursue the use of a spadroon, is there a certain replica you are considering?